Infiniti expects its 3.0-liter biturbo V6 with 300 horsepower and 295 pound-feet of torque to comprise the largest sales volume in the Q50 lineup in the U.S, and the company now says rear-wheel drive Q50 3.0t Premium starts at a competitive $39,900 (plus an additional $905 destination on all trims). All-wheel drive takes the price up to $41,900. If you prefer a little more excitement behind the wheel, Q50 Sport pairs the V6 with Direct Adaptive Steering, driver-selectable Dynamic Digital Suspension settings, 19-inch wheels, larger brakes, sport seats, aluminum pedal trim, and magnesium paddle shifters. It’s $43,900 for a rear-wheel drive version, and all-wheel drive takes the price up to $45,900. The 3.0-liter’s pricing shows that Infiniti has its sights on BMW and Mercedes' sedans. At 300 hp, the biturbo engine has nearly 60 hp more than a 241-hp Mercedes C300, but the Japanese sedan starts at just $950 more (before destination). The Infiniti also costs $1,550 more more than a base, 240-hp BMW 328i but also offers buyers an extra 60 hp. The engine's pricing also means that the least expensive V6 model is about $6,000 more expensive than a base Q50 2.0t, which starts at $33,950. However, the larger engine is a nice upgrade in power compared to the 2.0-liter turbocharged four cylinder's 208 hp and 258 hp. If the standard version of the biturbo V6 isn’t enough for you, the Red Sport has a hotter tune with 400 hp and 350 lb-ft of torque. It costs $47,950, and all-wheel drive is an additional $2,000. One other alternative for Q50 buyers is the hybrid with 360 total system horsepower, which starts at $47,050. All the Q50 trims are currently available at U.S. dealers. 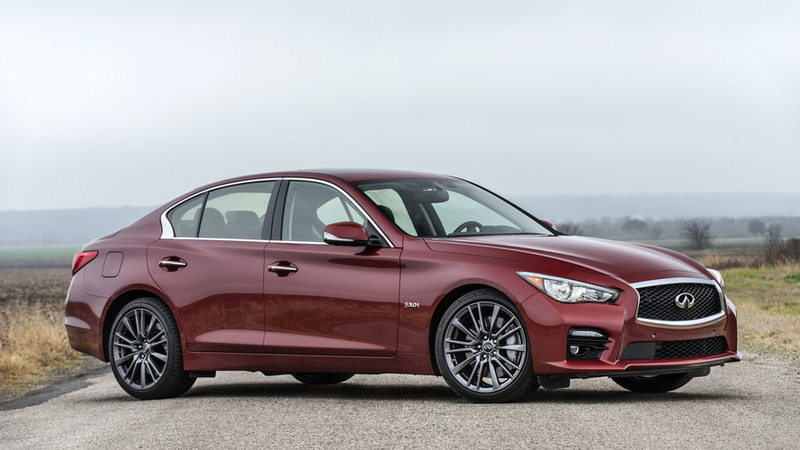 NASHVILLE, Tenn. – Infiniti today announced pricing for four 2016 Infiniti Q50 3.0t models – each equipped with the all-new 300-horsepower 3.0-liter V6 twin turbo engine. The new Q50 3.0t models complete the 2016 Q50 lineup, which now offers buyers a choice of four powerplants and 12 models – all of which are on sale now at Infiniti retailers nationwide. "The 2016 Q50 3.0t Premium's new VR-series 3.0-liter V6 twin turbo engine produces 300 horsepower and 295 lb-ft of torque," said Randy Parker, vice president, Infiniti America. "Positioned as the core volume trim, the Q50 3.0t offers twin turbo V6 performance at a starting MSRP under $40,000 – a price comparable to 4-cylinder engine-equipped vehicles offered by our main competitors." The new Infiniti Q50 Sport models offer an updated Direct Adaptive Steering® system and driver-selectable Dynamic Digital Suspension, further enhancing the driving experience. Designated by the silver chrome "S" badge on the trunk, Sport models also feature a sport styled front fascia, 19-inch sport wheels, larger sport brakes, leather-appointed sport seats, aluminum-accented pedals and solid magnesium paddle shifters. 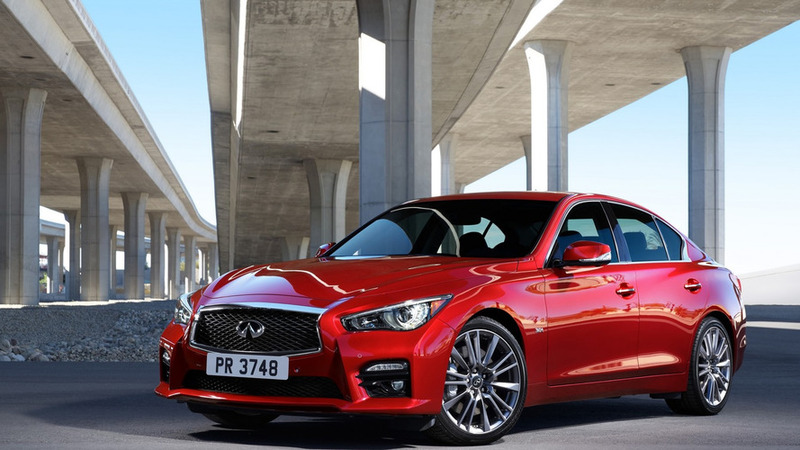 The 2016 Infiniti Q50 is also available with three other powertrains – a new 2.0-liter I4 turbo, a 3.5-liter V6 hybrid and the performance flagship of the Q50 portfolio, the Q50 Red Sport 400 equipped with an advanced 400-horsepower/350 lb-ft of torque version of the 3.0-liter V6 twin turbo engine. The Q50 2.0t and Q50 Hybrid Premium models offer pricing starting at $33,950 and $47,050 respectively. The Q50 Red Sport 400 has a starting MSRP of $47,950. For full pricing and product information on the full 2016 Infiniti lineup, please go to InfinitiNews.com.